This supplement clocks in at 21 pages, 1 page front cover, 1 page editorial, 1 page ToC, 2 pages of SRD, 1 page back cover, leaving us with 15 pages of content, though it should be noted that these pages are laid out in a horizontal standard optimized for e-readers – that is, letter-size is pretty large. The city station of Orbi sits on a disk dozens of miles across a city of metal and glass, with a central tower of black supporting an almost translucent platform almost as large as the city itself. Streets of warm laughter and cheer make the city of Orbi, home of the Nomi, a galactic entertainment hub. The city can fly and take to the air sans even a ripple of air, often traveling not only from place to place, but from world to world. Glass platform and city floor form an airtight bubble, allowing for travel through space. The city of Orbi is thus a great way to travel and with its incredibly complex engine, the small, gregarious and open nomi, perpetually interested in new impulses and cultures, are a central focus of what makes this cosmopolitan place so compelling. As hinted at before, Orbi does regularly land on planets, and thus could potentially act as a place to meet primitive cultures or provide a culture-shock for characters; as a means to transition or marry science-fantasy and sword-and-planet, for example, this rather works well. The engine of the Orbi is mostly magical, and the city houses almost 600.000 inhabitants, 5/6th of whom are nomi. The city station follows a 256-day year, and population is controlled, with deaths and emigrants counted and then, a procreation season at the start of the year. It should be noted that sexual activity is not frowned upon – as long as procreation is limited to the proper season. Non-nomi are not subject to these official regulation, and immigrant passes and the general focus on the arts make the place seem pretty liberal. The pdf also explains to use the history of the 200-year-old city ship, mentions the good guy in charge (an android soldier/technomancer, mentioned in fluff-only – Nomi aren’t that inclined to long-term planning), the bitter local fruits grown, etc. While there are dissenters that wish the city closed to immigrants (their leader is once again mentioned), the decision is still up in the air. The city, unlike the standard SFRPG engines, is powered by the Bend Engine, a magical device that bends space. Somewhat to my chagrin, we don’t get stats for the bend engine, which is a bit of a pity, as it certainly has a lot of narrative potential and would make for a nice starship upgrade at higher levels of escalation down the plot line. We do get an overview of the outer and inner ring and the movers and shakers to be found there, as well as a brief summary of the 6 flavorful ships noted as pretty much permanent fixtures. Once more, ship stats would have been nice. The pdf also includes a write-up of the Nomi, who get +2 Charisma and Intelligence, -2 Strength (making them lopsided on the mental side of things), 3 Hit Points, and they are Small humanoids with the Nomi subtype. They have a pair or arms, a pair of legs, and a pair of limbs that can be used as either. Changing modes for these limbs (for wielding/holding more items or base speed increase by 10 ft.) is a swift action. Cool, if not as refined or fun as e.g. The Ydreft from Star Log.EM: Ydreft. Nomi get Skill Focus as a bonus feat, and may 1/day spend an hour to retrain to which skill this feat applies. They also receive a +2 racial bonus on checks made with tools, and o checks to make use or activate unknown technology. (It’d have been nice to get some guidelines what constitutes unknown technology). Beyond these stats, the nomi come with a full proper write-up regarding relations, homeworld, and even the often overlooked “Playing as a Nomi”-section including what other races may think about them. Kudos! Speaking of which: The pdf even provides notes on nomenclature and vital statistics, such as average height, maximum age etc. Editing and formatting re very good on a formal and rules-language level. Layout adheres to a horizontal two-column full-color standard with a blue background and light yellow text. The layout is optimized for e-readers, which means that this isn’t exactly printer-friendly. The pdf has no interior artwork, but does come with proper bookmarks for easy navigation. 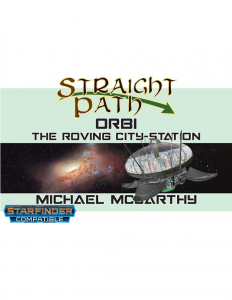 Michael McCarthy’s Orbi is a fun city station. I like the take on a traveling good-guy station, and the nomi, while weird, are also rather charming. They are good-guy aliens. One could easily interpret an artist’s city-on-a-hill-metaphor into the place, though that, if intended, is subtextual and something most folk probably won’t notice. All in all, I really enjoyed this supplement. Orbi is a fun place, has quite a lot of adventuring potential, and features some evocative, cool ideas. If anything, it does suffer a bit from the lack of stats for the ships noted, the engine, etc. Mind you, at this low price-point, this is definitely a good purchase, but it could have easily been a fantastic one with a bit more crunch. This is still very much worth checking out, though. My final verdict will clock in at 4 stars. You can get this nice city station here on OBS! Thanks for the excellent review, Thilo, as always. Stay awesome!